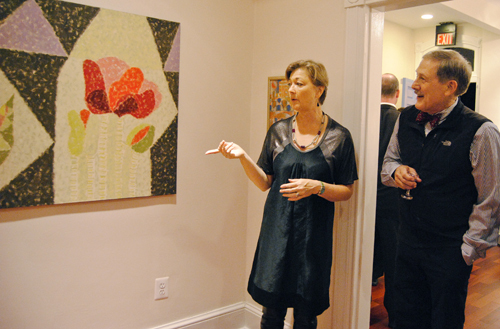 Dianne Beal showcased Russian artists' work at her gallery opening Thursday. Avra Bossov | Hatchet Photographer. This post was written by Hatchet reporter Samantha Hatton. After graduating with a master’s in international affairs, alumna Dianne Beal pursued her passion for Russian art. She spent eight years overseas before returning to the District to expose the area to contemporary Russian artists. Beal’s Galerie Blue Square celebrated its grand opening Thursday at 6:30 p.m. Beal co-founded a gallery by the same name in Paris with fellow curator Vincent Sator in 2007. Zubkov’s paintings on display are available for purchase by gallery visitors. The “Form + Color” exhibit will be open through Dec. 7. Beal will continue to work with Sator, who has plans to open another gallery in Paris.